Please read the following conditions carefully as the return of your deposit requires meeting these conditions, which you are deemed to accept as part of your booking. Thank you, your cooperation is appreciated and we wish you a very successful and enjoyable function! Please call Gill Shaw 8567 0999 for further information. Please note that the times that you book the hall for include the time before the start of your function for setting up and also the time for clearing up afterwards. Keys should be collected from the Hall Bookings Administrator in the week before to arrange a suitable time. The key will give you access to the hall via the side (kitchen) door. This key also unlocks the chair store. The main foyer doors open from the inside. All doors must be securely locked when you vacate the hall. The keys must be returned to the Hall Bookings Administrator as soon as your use of the hall is over. All areas within the hall are no smoking. The hall does not employ a full time cleaner. The hall must be left clean and tidy after use. A wide broom to sweep the floor is kept in the kitchen, as are spare toilet rolls, a mop to clean up any spills of liquid and other cleaning materials. All cutlery and crockery must be washed, dried and put away, a dishwasher is provided. It is a condition of use that the hall that it is left as you find it, particularly for all weekend bookings. 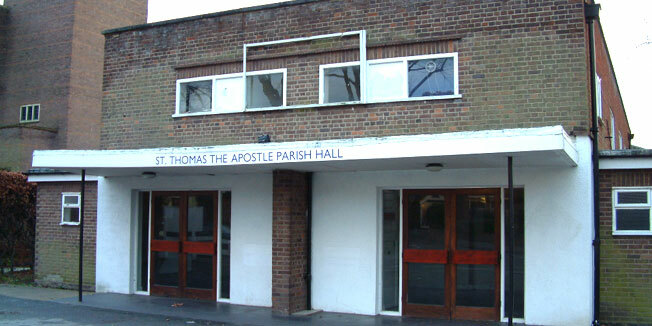 St Thomas’s Church uses the hall for its Sunday activities. Cleaning must not be left until Sunday. If the hall floor requires cleaning and polishing, or the kitchen is not ready for use, then you will forfeit your deposit. Unfortunately we are unable to take responsibility for your refuse; therefore all rubbish must be taken away by you. Constant hot water is provided in the kitchen. You can switch on the heating by pressing the ‘extend’ button on the boiler controller in the kitchen. This gives one hour of heating. Simply press it again for further hour(s). Please leave only the blue chairs in the hall after use. You are welcome to use any or all of the chairs and tables but please ensure that they are clean and return them to the chair and table store after use. Nothing must be stuck (by whatever means) to the walls or window or door frames. Decorations may be affixed to the picture rails but please remove them after use. If you ensure that all the doors are kept closed then any noise will be contained within the hall. Please ensure that your party does not extend outside the hall where it may cause annoyance to our neighbours. Your booking finishes at the time stated on your booking form. The hall must be fully vacated by that time. Please turn off all lights, lock all the doors, return chairs and tables and clean up. Please note that if the hall is not vacated on time you will forfeit your deposit. We reserve the right to exclude from the hall anyone who is under the influence of drugs or alcohol or whose behaviour is unreasonable or contrary to any of the above conditions.